Christmas may be over, but Christmas cards are still pouring in. 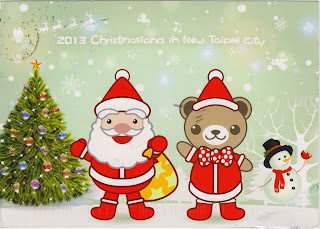 The latest addition was postcard TW-1107953 from the Christmasland (新北市歡樂聖誕城) in New Taipei City, Taiwan. In addition to usual Christmas trees, decorations and concerts, there was a Christmas Post Office with a special pictorial stamp! The profit from the postcard sale benefited public charities.